A Very Vanilla card base, with a Crumb Cake Layer. I stamped the Bloom with Hope flower in Hello Honey, then sponged a little Hello Honey onto the petals and some Early Espresso onto the center. I popped the Crumb Cake layer up with Stampin' Dimensionals. I stamped the sentiments from Something to say in Early Espresso. Added a little Burlap and Hello Honey Ribbon with a mini staple, and called it a night. 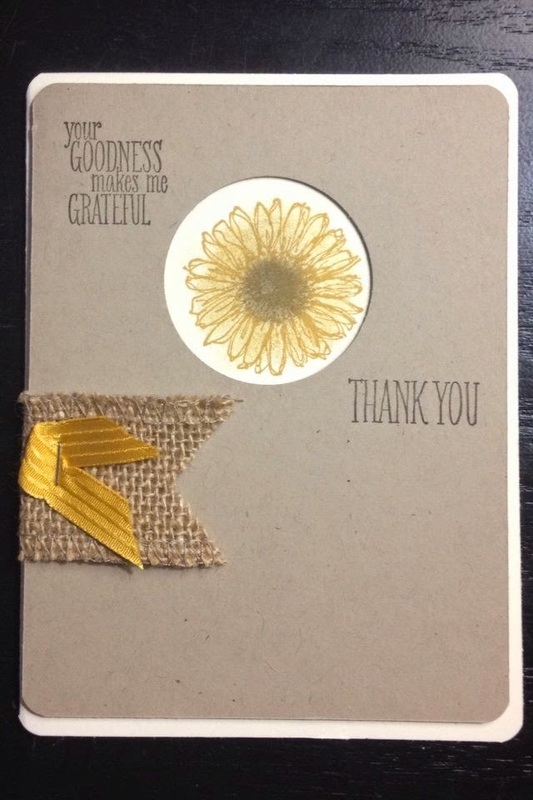 Pretty quick card, thankfully, as I am knee deep in swap cards for this weekends Excite and Unite Stampin' Up! event!! Can't wait to road trip with my stampin' sisters and enjoy an afternoon of fun and inspiration! REMINDER: the HALF OFF your first TWO months of Paper Pumpkin offer ENDS on September 10th. Go register TODAY to be sure you don't miss out! Paper Pumpkin is a monthly craft kit sent directly to your door. It's normally $19.95 per month, which INCLUDES shipping. Everything you need to complete the professionally designed project is included in the box: exclusive stamp sets, ink, directions with photos, all paper and embellishments - pre cut, scored and self adhesive, or adhesive is included. Its a GREAT deal, and at HALF OFF certainly worth a try!! Become a member at www.MyPaperPumpkin.com and be sure to enter the Promo Code HALFOFF2 to get the 50% discount on your first two months!! There is no obligation, you can suspend your subscription at any time, or cancel with no fees. But hurry - this offer is only good through 9/10/14. I'm happy to answer any questions, I've been a member of My Paper Pumpkin for over a year and I enjoy the simple break - or the challenge of creating something new (when I have the energy!) LOL I think its a great program for new crafters AND for you more seasoned crafters! !